You plan for every detail so that your day is perfect, as it should be. One detail is how to make sure that the two groups of guests, many of whom will not have met before, can get to know each other in a relaxed and entertaining way. During the photographs many of your guests will not be directly involved, and this is when booking a magician can help to break the ice. 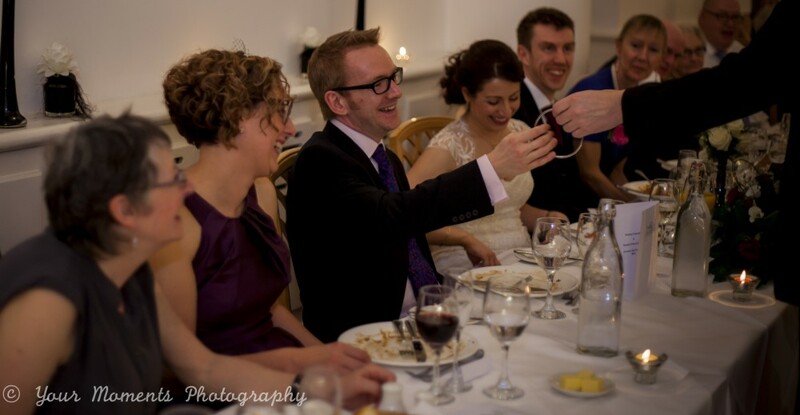 I can stroll through the drinks reception performing small and intimate magic shows for groups as they wait for the wedding party to return, bringing everyone together and ensuring that they enjoy the day as much as you do. Another option is to entertain around the tables during the wedding breakfast if there is no defined reception time! It’s not uncommon to have some children at weddings, and sometimes their attention spans can get stretched ever so slightly. Although I’m not a kids’ entertainer per se, I have found that by treating them with respect and not talking down to them, children can easily follow my routines, and often react just as well as the ‘grown ups’. If you are planning your wedding and would like to discuss how I can help to add a wee bit more magic to it, drop me a line through the contact page. Thank you so much for making our day even more magical. Having entertainment suitable for guests of all ages whilst they waited for the photographer etc to finish up made such a difference! Our guests thought it was excellent and everyone was amazed. Thank you!